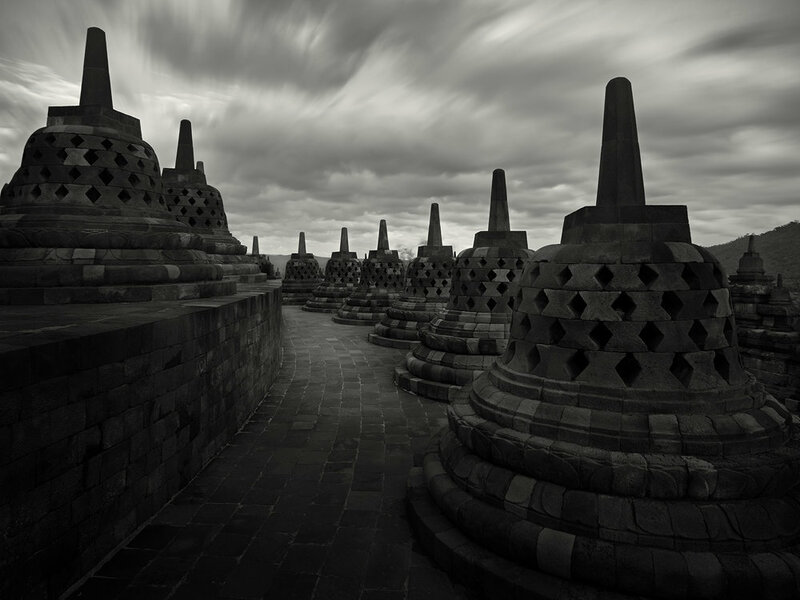 In Central Java, Indonesia, the world’s largest and most majestic Buddhist temple was built during the the 9th century. Construction continued into the 14th-century and the structure was left unfinished after the decline of Hindu kingdoms and the island of Java conversion to Islam. Java was under British rule in 1814, and Sir Thomas Stamford Raffles, was made aware of the temple by the indigenous people which had been buried under ash from volcano eruptions and jungle since the 14th century. Modern restoration by the Indonesian government and UNIESCO took place from 1975 and 1982 and the site was deemed a World Heritage Site. The structure features nine stacked platforms, three of which are circular and six square and a central dome on top. Borobudur is built on a natural hill and stairways at the center of the four sides allow access to the top via arched gates. There are hundreds of statues of Buddha and over 2,600 relief panels featuring indigenous scenes and uniquely Indonesian elements.